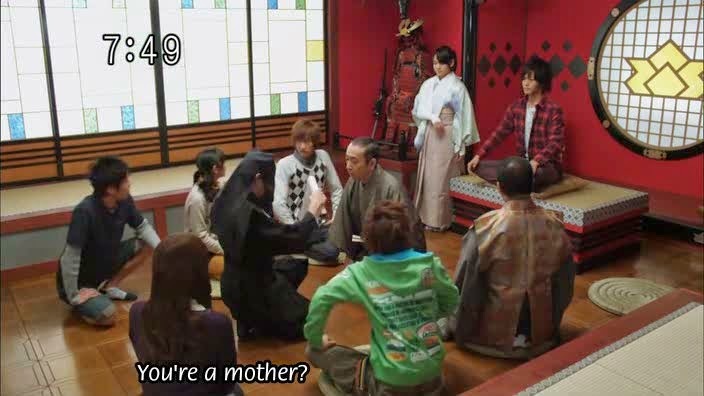 EZ Rider counts down ten of the coolest mothers in tokusatsu in no particular order. 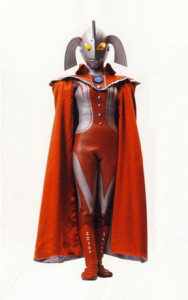 Hey Toku Faithful. Since today is Mother’s Day and since both of my mothers are no longer in this world I wanted to do something special. This originally was going to be a video countdown (and I may still make it someday) but right now I have reviews and some other projects to work on that I haven’t the time to make said video right now. Also there may be SPOILERS so read on at your own risk. That being said, this is my Top 10 Mothers of Tokusatsu. She’s not exactly the perfect mom since the most memorable thing she did to her son was burn a tiger tattoo on his arm when he was very young, but she meant well. There was a reason for it. Kou spends several episodes struggling with his mother issues but still wishes to save her from the Gouma. At least she can rely on her son who turns into a great senshi with the help of a certain tiger sword. Maya used to be the all-powerful Fangire queen who struck down with great vengeance and furious anger at those of her own species who dared to love humans……..until she fell in love with the protagonist’s human father. Well, nobody’s perfect. Maya had not one but two sons and she had to watch what no mother should ever have to see, her two children at war with each other. Wataru and Taiga may not have fought for their mother’s love (well, one of them did want something she had) but god bless her for trying to be the voice of reason between two brothers who just could not get along. If anyone deserves some love this day it’s her. Goh was pushed by his mother to be the best and brightest student around. Then he joined an evil space empire and turned into a human Piranha Plant, and later a horned monstrosity. If this does not symbolize “pushing your child too far” I don’t know what does. To be fair though when she does see what her son became she realizes the error of her ways, deciding to accept her son for who he really is (so few mothers do). I already mentioned this in my Liveman review but I neglected to mention that this subplot ends with both mother and child being alive and normal. That is extremely rare in tokusatsu and this is one of the many reasons why it’s a personal favorite series of mine. We don’t see much of Haruka or her parenting skills in the series but her appearance in the Blade movie, Missing Ace, deserves special mention. Basically her daughter Amane has grown up to be a thieving hoodlum, and Haruka tries her best to figure out why she’s doing this but gets shrugged off. God only know how many mothers have had to suffer through their child’s angst-ridden teenage years and managed to put up with it. Amane is only a little more reserved in the series (though as she’s only 9 years old there) but is still infatuated with a man who is old enough to be her father (poor Hajime). Haruka, pour a tall one on this day. You’ve earned it. Could I have done this list without one of the best toku moms ever? Ultra Mother has always been there for the Ultra Brothers. She does what most mothers do for their children, tend to their wounds. I think I’ll remember her appearance in Mebius the most where she gave Ultraman Hikari a new lease on life after nearly dying in a battle as Hunter Knight Tsurugi. Ultramom doesn’t just heal the sick and wounded though. She can get into the fight and shows the invading aliens why you do not mess with her boys. Miki Misaki used to be a student of Geki Jyuken but now serves as the weapon designer for the Gekirangers and their base of operations SCRTC. She often lends moral support when needed to our heroes. She also has a daughter, named Natsumi, to whom Miki takes good care of but she tends to get into some random misadventures with Jan/GekiRed. Miki spiritually fills the role of mother to the entire team as she’s helped several of them out on many occasions throughout the series whether it be advice or joining the fight. Even piloting a mech in one battle. It turns out Miki also used to run with a bad crowd when she was young as it is later revealed she used to be the leader of a gang of sukeban (delinquents/thugs). When Natsumi found out about this she swore never to defy her mother again. Now that’s parenting! This may be a MAJOR spoiler for those who have not seen Shinkenger but I don’t care. This is hands down one of my favorite twists in Sentai history. Kaoru Shiba reveals herself as the true head of the Shiba Clan but once she realizes she’s not up to snuff and Takeru, a non-Shiba faker, has been doing a much better job this whole time she…adopts him! Yes, this young girl is now a mother. And Takeru’s subtle way of calling Kaoru mother is just priceless. Smart, beautiful, and pretty handy with a giant sword, Kaoru is one red hot mama. Yuri Aso may have not have spent much time with her little girl, Megumi, but for the short time they knew each other (from childhood, and again via time travel in the Kiva movie) you could tell that Yuri was no slouch in the mom department. 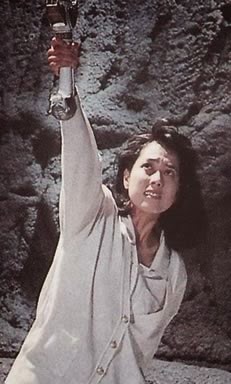 Yuri was already a skilled Fangire huntress (in an action leather suit no less) but once she was able to use the IXA powers, alongside her daughter in their respective times, she was the mom you did NOT mess around with. She even teamed up with her daughter in the present (well, 2008 to be precise) and used the IXA powers again to team up. The family that slays together stays together. 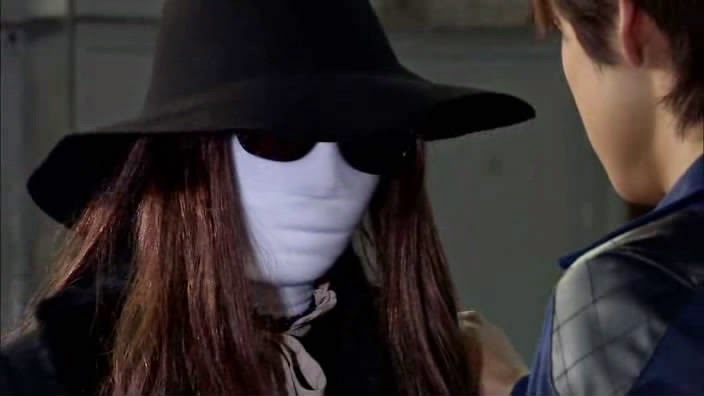 Another possible big SPOILER for Kamen Rider W. Shroud meant well as the mother of Phillip (a.k.a Raito) by helping him to stop her husband Ryubee, their two psychotic daughters, and the distribution of Dopant Gaia Memories. 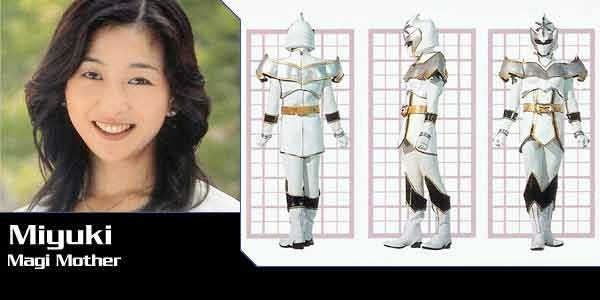 She also helped Sokichi Narumi and Ryu Terui become riders themselves, not to mention giving them all some nifty toys-I mean support items when they were in a pinch. She was a helpful mother but one problem was that she was a bit overprotective of her son and constantly trying to get him to turn away from his partner and best friend Shoutarou. We’ve all been there and have gotten the standard lecture of “your friend is a bad influence/he’s holding you back etc etc” from our mothers about at least one of our childhood chums. Eventually though she lets him be friends with who he wants to and therefore becomes a better mother for it. At least she had one good child that did not become a homicidal maniac, am I right? Her name says it all. Magic Mother. Miyuki has to be the best mom I have ever seen. How many mothers do you know that would 1) Give their children magic powers and 2) Let them run outside and play with these new powers. And fight evil untrained, while she stayed behind and prayed inside a hollow pyramid? Well okay, to be fair she is not the be all end all perfect mother but she does have her moments. Besides, any mom who will become giant and take on a giant evil centaur to protect them must be doing something right. Even if she is not in the series that much (not a spoiler, it happens 2 episodes in) her good nature and wisdom actually makes the Ozu’s a better family when she is not around. Kai stops being a runt of the family who rushes in without thinking, Tsubasa steps up to be the responsible one, Urara becomes the family moral compass and caregiver and so on and so forth. So just because your mother isn’t always there for you doesn’t mean she still can’t help you in life. Thank you MagiMother. May your wisdom and kindheartedness carry on through generations of toku fans. There you have it Toku Faithful. Sorry if yours did not make the list. Now go call and/or spend time with your mother while you still can. You never know how much time you have left with them. Later.